I know I’ve already told you how much I love Sunday lunch. The Sundays I spent eating dim sum with my dad at Bernard’s in the Chestnut Hill Mall. Or the Sundays we went to Viet Hong and split a bowl of pho. Or the Sundays we sat at the bar at Legal Sea Foods and talked to our favorite bartender over light clam chowder (the cream-less version where you can actually taste the clams). Or the Sundays in Rangeley when dad made eggs florentine and the smell tantalized us for a full hour before it was ready to eat. Sunday lunch is perfect in so many ways. It’s far enough into the weekend that the week feels like a distant memory, but there’s still a long lazy afternoon ahead. And there’s so much time to eat, slowly, lazily, happily. If you’re a kitchen addict like me, Sunday lunch also affords you lots of time to cook. Time for those complicated, multi-step, multi-bowl recipes that are far too ambitious for a weeknight. I woke up this Sunday ready to cook. I barely finished my coffee before I pulled out my favorite cookbook and went to work. I’ve had my eye on this recipe for quite some time, a pot pie with the flakiest, richest crust you can possibly imagine filled with white beans, chard, pancetta (yes!) and thick, silky smooth gravy. It brought Sunday lunch perfection to a whole new level. 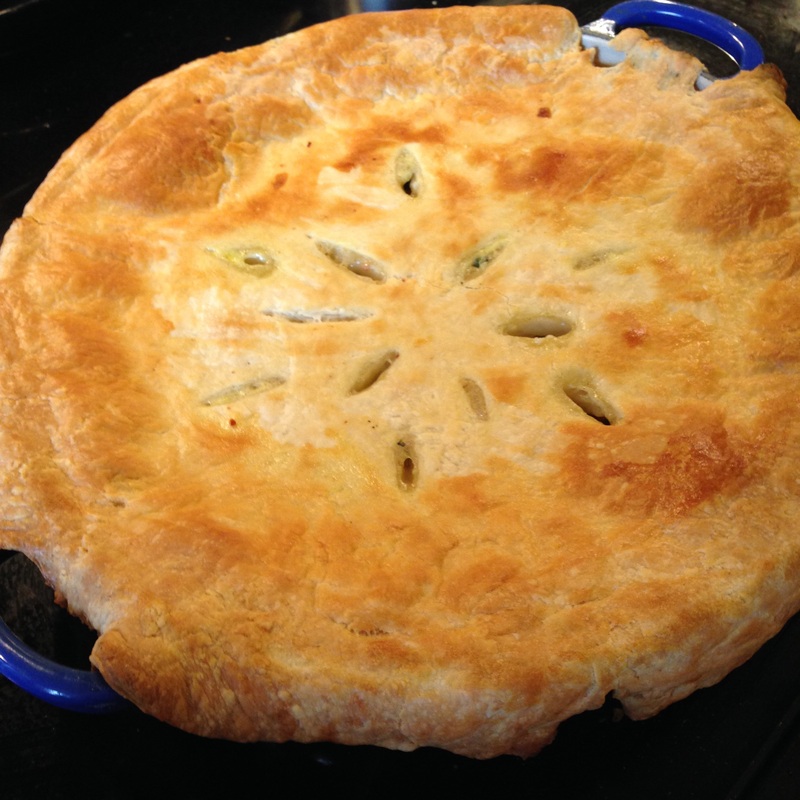 This glorious potpie served as my going away gift to Matt, who is out of town on business all week. I have to admit, my first thought when he told me he would be gone was, “Now I can make all those recipes with ingredients he doesn’t like!” There’s a stuffed eggplant recipe and a baked shells and artichokes in bechamel sauce, arroz con leche and ratatouille. But a few hours into my week of singledom and I’m already singing a different tune, partly because I have at least ten servings of potpie to consume over the next four days. And partly because, if I’m really honest with myself, it’s just not any fun to go through the whole cooking rigamarole without anyone but me to enjoy the end result. And so, here I am. In my pajamas on the couch, eating a double serving of potpie (followed by a double serving of ice cream) with absolutely no intention of using the stove in the next 72 hours. And missing my favorite dining partner immensely. Make lids: In a large, wide bowl (preferably one that you can get your hands into), combine the fl our and salt. Add the butter and, using a pastry blender or your fingertips, cut them up and into the flour mixture until it resembles little pebbles. Keep breaking up the bits of butter until the texture is like uncooked couscous. In a small dish, whisk together the sour cream, vinegar, and water, and combine it with the butter-flour mixture. Using a flexible spatula, stir the wet and the dry together until a craggy dough forms. If needed, get your hands into the bowl to knead it a few times into one big ball. Pat it into a flattish ball, wrap it in plastic wrap, and chill it in the fridge for 1 hour or up to 2 days. Make filling: Heat 1 tablespoon olive oil over medium- high heat in a large, wide saucepan, and then add the pancetta. Brown the pancetta, turning it frequently, so that it colors and crisps on all sides; this takes about 10 minutes. Remove it with a slotted spoon, and drain it on paper towels before transferring to a medium bowl. Leave the heat on and the renderings in the pan. Add an additional tablespoon of olive oil if needed and heat it until it is shimmering. Add onions, carrot, celery, red pepper flakes, and a few pinches of salt, and cook over medium heat until the vegetables are softened and begin to take on color, about 7 to 8 minutes. Add the garlic, and cook for 1 minute more. Add the greens and cook until wilted, about 2 to 3 minutes. Season with the additional salt and freshly ground black pepper to taste. Transfer all of the cooked vegetables to the bowl with the pancetta, and set aside. Make sauce: Wipe out the large saucepan; don’t worry if any bits remain stuck to the bottom. Then melt the butter in the saucepan over medium- low heat. Add the flour, and stir with a whisk until combined. Continue cooking for 2 minutes, stirring the whole time, until it begins to take on a little color. Whisk in the broth, one ladleful at a time, mixing completely between additions. Once you’ve added one- third of the broth, you can begin to add the rest more quickly, two to three ladlefuls at a time; at this point you can scrape up any bits that were stuck to the bottom — they’ll add great flavor. Assemble and cook pot pies: Divide the filling between four ovenproof 2-cup bowls. (You’ll have about 1 1/2 cups filling in each.) Set the bowls on a baking pan. Divide the dough into four pieces, and roll it out into rounds that will cover your bowls with an overhang, or about 1 inch wider in diameter than your bowls. Whisk the egg wash and brush it lightly around the top rim of your bowls (to keep the lid glued on; nobody likes losing their lid!) and drape the pastry over each, pressing gently to adhere it. Brush the lids with egg wash, then cut decorative vents (smaller than mine, please, as they led to lots of draping) in each to help steam escape. Bake until crust is lightly bronzed and filling is bubbling, about 30 to 35 minutes. Do ahead: The dough, wrapped twice in plastic wrap and slipped into a freezer bag, will keep for up to 2 days in the fridge, and for a couple months in the freezer. The filling can be made up to a day in advance and stored in a covered container in the fridge. Tags: baked goods, baking, dough, lunch, pie, winter | Permalink.